Experience the very best of Lake Coeur d’Alene away from the hustle and bustle of the city in this charming Harrison condo which features a private marina, boat slip rentals, and even an indoor community pool for your next lakeside getaway! Ideal for small families or friends, the cheery space is the perfect home base for water sports and hiking! Located in Arrow Point condos, the vacation rental is scenic and lovely, offering a beach volleyball court and marina directly on the lake. You're within 20 miles of both Harrison and Coeur d’Alene for supplies, breweries, restaurants, farmers markets, and family-attractions! Inside, the space is cozy and casual offering an open living room, kitchen, and dining room. Temperature controls include a gas fireplace and central AC, and media entertainment includes cable and complimentary WiFi. You’ll never have trouble feeding hungry troops thanks to a fully stocked kitchen and indoor or outdoor dinner seating, including a partially-covered patio. Large cupboards, a french-door refrigerator, and dishwasher are ideal for food storage and cleanup for extended stays! With two full baths and two bedrooms, the space comfortably sleeps six guests. Choose from a master suite with a private bath and king bed, or a guest room with a twin-over-double bunk bed with an added trundle bed and twin mattress. Beyond your family-friendly condo, the wilderness and lake are just waiting to be explored! Tee off at the nearby Gozzer Ranch Golf & Lake Club or watch the sailboats race from the Panhandle Yacht Club. If you’re not traveling with a boat or jet ski, rent one from Harrison Idaho Water Adventure to spend long days fishing, tubing, and swimming on the beautiful Lake Coeur d’Alene. The community of Harrison is adorable, featuring ice cream parlors, pubs, bike rentals, and even live music at the Gateway Marina. Coeur d’Alene is more of a resort town and boasts art galleries, breweries, fine dining, and spas! For the ultimate family day trip, ride the rollercoasters and waterslides just 35 miles from home at Silverwood Theme Park! Wherever you roam, you’ll love coming home to the indoor pool and your quiet lakefront condo. Don’t wait until summer vacation to book this ultimate vacation rental on the lake! Parking Notes: Your assigned garage space is marked A-203. Should you have more than one car, the second car must be parked outside the building in the open parking lot facing the volleyball court/pool house. Boat parking is available from Discovery Marina for $35 per day on "C" Dock. 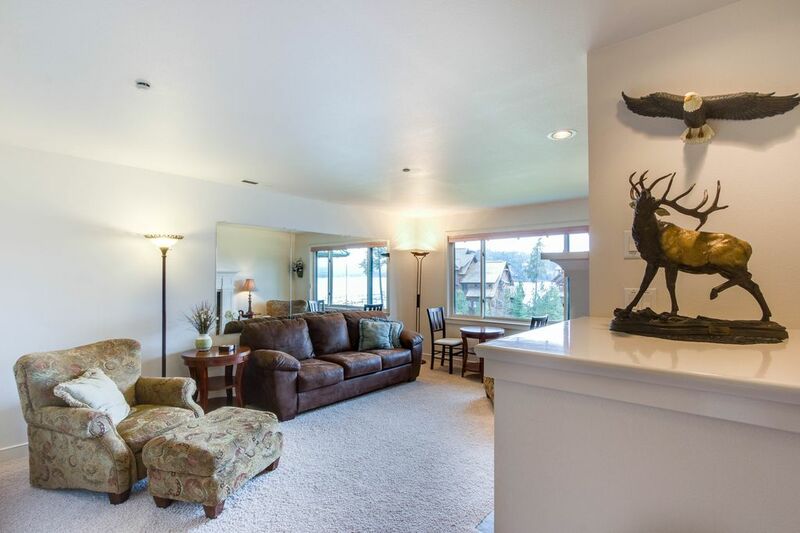 This condo was spacious, very clean and beautifully decorated. The condo was perfect and very clean. It had everything needed EXCEPT a coffee pot to go with the coffee maker. The location was somewhat disappointing. It was much further from Coeur d'Alene than anticipated, which wouldn't have been so bad if there was at least a convenience store nearby and something to do that didn't require you being a member. The pool was nice to have, although quite crowded most times we went. Overall, this home is beautiful and the sights were breathtaking. Perfect place to go if you just want to sit around and enjoy nature (remember to get lots of groceries before driving up there) as there isn't a restaurant or even a vending machine within 30 minutes. It is true these condos are 30 miles from the nearest location to get food, and we do our best to call and warn guests prior to arrival to pick-up all food and supplies before reaching the condo. We have replaced the coffee pot and apologize it was not there for our guest. Great place, 2 bedrooms, 2 bathrooms and laundry! Very clean. Great place, will stay there again! We were in town for a soccer tournament. It was a very nice stay. Very relaxing.